This novel, set in the early 1990s, sees a young talent rocketed to stardom. And that’s just the beginning. Poet of the Wrong Generation is a tale of star-crossed lovers, isolating stardom, and a lovable underdog with the soul of a poet. I enjoyed this story very much. The writing was good, but not completely captivating. There were a few places where I felt the life of the narration was draining away, and that maybe it could have been condensed into either a shorter story, or turned into a series. Lonnie Ostrow paints a vivid picture of what life may be like when a young person is selected for a shot at stardom. The turmoil, the isolation, the non-stop travel and concerts – it wears away at the soul. Can Johnny, our protagonist, survive the rigours of a hit album and gruelling tour schedule while also being pushed to create new music? Can he have a life outside the music business? Will he be happy, and satisfy his poet soul, trying to please everyone? The back of the book states: “Poet projects the epic clash between true contentment and the fable of stardom’s rewards; a nostalgic journey through the major events of the 1990s, with a cherished cast of characters and a stunningly unpredictable conclusion.” While I don’t disagree with the statement here, I wasn’t so thrilled with the ending. I was glad to finally get to the ending, however. I felt like there had been quite a few times the story could have ended before the final conclusion. 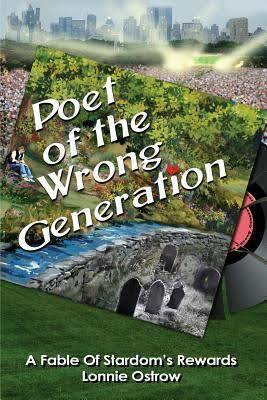 An easy read, Poet of the Wrong Generation (affiliate link) is an interesting story. The characters were well-rounded and believable, the writing had a good flow and I was happy to follow Johnny’s journey. If you are interested in having me review your book, please visit my Book Review page. Fill out the contact form there, or drop me an email. I’m cutting back my reviews to one per month soon (once I get through my backlog of books) but I’d love to hear from you!